It seems easy to lose hope for a better life in Bulgaria–more than half of the young people between the ages of 18 and 25 are willing to leave their country. The mood among those studying medicine is especially alarming; two-thirds of them claim that they would like to seek their happiness abroad. Their reasons are well-known and all relate to the buzzwords “corruption” and “a lack of jobs and perspectives”. What would an ideal Bulgaria look like for these young people? What kind of country would make young people stay? What do terms like ‘corruption’ really mean for these young people and their families, abstract definitions aside? These were all questions tackled by 60 students during the youth seminar “Dream Bulgaria–the Future of Democracy in Bulgaria”, organised by FNF Southeast Europe and local partners earlier this summer. The students’ responses to those questions were presented by three youth seminar participants at the international conference “Reshape Bulgaria, Reshape Europe“ on 12 October 2017, and provoked a lively political debate with representatives of the three largest political parties in the country. “Not typical political talks, but concrete solutions to concrete challenges” demanded Joanna Dermendjieva, a 23 year-old who recently graduated in Germany. “There are three things in Bulgaria, which have to be urgently and fundamentally changed: the judiciary and the lack of fight against corruption, the health care system, and the educational system. Successful measures in these areas will also decrease the political apathy that is so prevalent in our country” she added. Deputy Foreign Minister Georg Georgiev from the ruling GERB party, Denitsa Zlateva, Vice-Chairman of the opposition party BSP, and the Vice-President of the Parliament, Nigyar Dzhafer, from the liberal MRF party, showed how different their perspectives on these challenges are. While the liberal Dzhafer insisted on the decentralisation and digitalisation of the health care system, the socialist Zlateva warned against the loss of basic medical care in many areas of the country. This problem exists in many regions of the country due to doctor scarcity. To counteract this, she called for an improvement of the financial resources of hospitals and higher salaries for health care workers. During the debate, the students made it clear that young people, especially those with an international education, could leave the country any time and look for better perspectives abroad. For their side, the three politicians proposed to institutionalise such kind of dialogue with youth so that they all could work together for a better Bulgaria. For a Bulgaria which young people would like to study, develop, and progress in, not leave. Shortly before Bulgaria’s first EU presidency of the European Council, starting on 1 January 2018, not only Bulgaria, but also the EU must be reformed in certain areas. Not only Brexit, but also nationalist tendencies in various member states, show that the European project should be further developed. Bulgaria’s role in this process was the central topic of discussion during the second part of the conference. 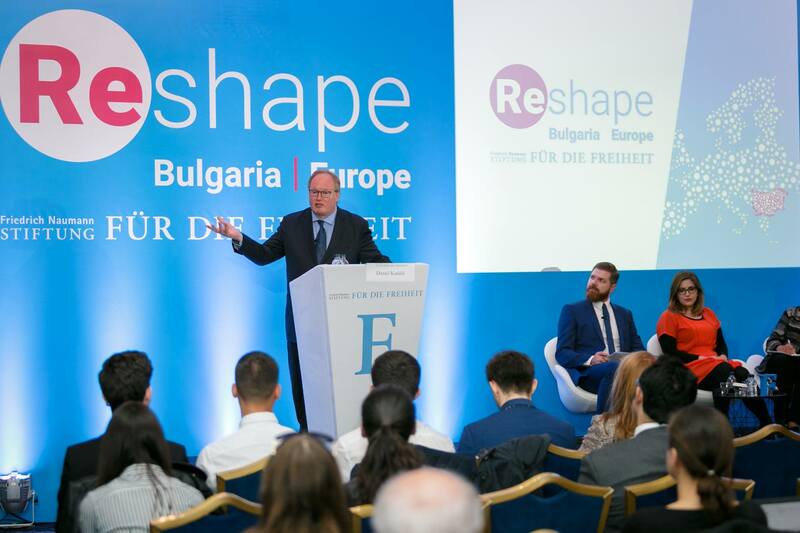 Hans van Baalen, ALDE party President and Member of the European Parliament, highlighted the urgent need for a liberal vision to make the EU more transparent, efficient, and democratic. 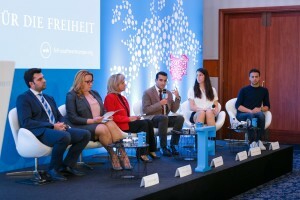 At the same time, the principle of subsidiarity should be at the forefront and the European Parliament as a democratic body should become an engine of integration, as Svenja Hahn, LYMEC Vice-President, demanded. Especially in the integration process of the Western Balkan countries, Bulgaria has the chance to take the lead and become a bridge between the Balkans and the EU. Additionally, Bulgaria, as an EU’s external border, can contribute to managing the refugee crisis and helping secure the territory of the union’s more than 500 million population. In a united Europe, young member states like Bulgaria must always remind others of why they have become an EU member: to contribute to the better future of the Europe of freedoms.